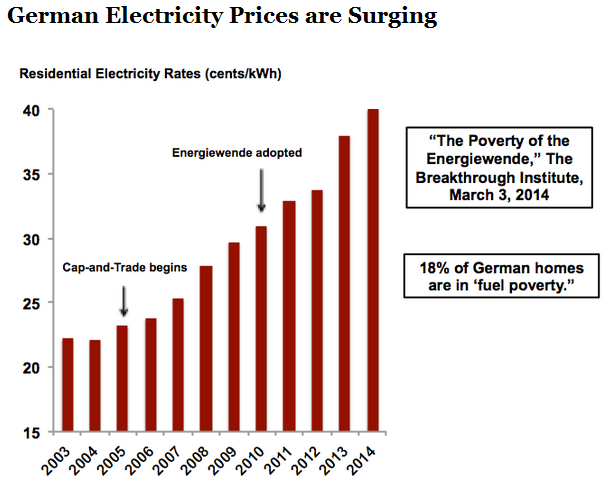 The Wind Scam Cripples Economies….World-Wide! As any student of that dismal science will tell you: for businesses, input costs matter. While wind-cultists claim that their beloveds wouldn’t hurt a fly, let alone wreck whole industries, the reality is a long way removed from eco-fascist fantasy. Jack up power prices and, all things equal, an energy hungry firm’s profits must fall and, along with profits, employment must fall too. South Australia, Australia’s ‘Wind Power Capital’ has seen power prices rocket (the forward price, at $90 per MWh is more than double its neighbour Victoria’s) and unemployment with it: worse is yet to come, on both scores. Then there’s the grid instability and state-wide blackouts that come with routine, total and totally unpredictable wind power output collapses.